Do you know how much money you may receive under the Affordable Care Act (also known as Obamacare)? If you are considered low-income or middle-income, you may be eligible to receive tax credits for use in purchasing health insurance. The Affordable Care Act goes into effect next year and will apply a sliding scale to determine who receives what. For example, if you earn two times the poverty rate, you may be eligible for the largest tax credits. The amount of these credits is also based on whether or not you are an individual or a family. 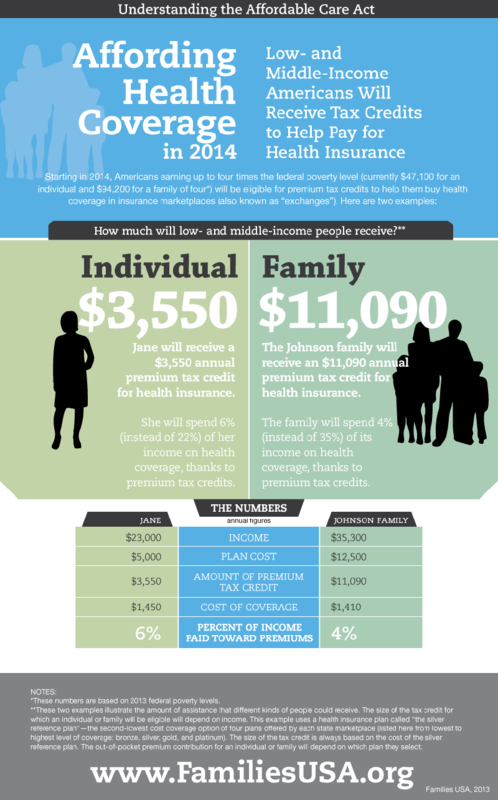 This infographic from Families USA, a non-profit consumer health-care advocacy organization, explains the requirements for the Affordable Care Act tax credits, as well as providing an example for an individual and a four-member family.